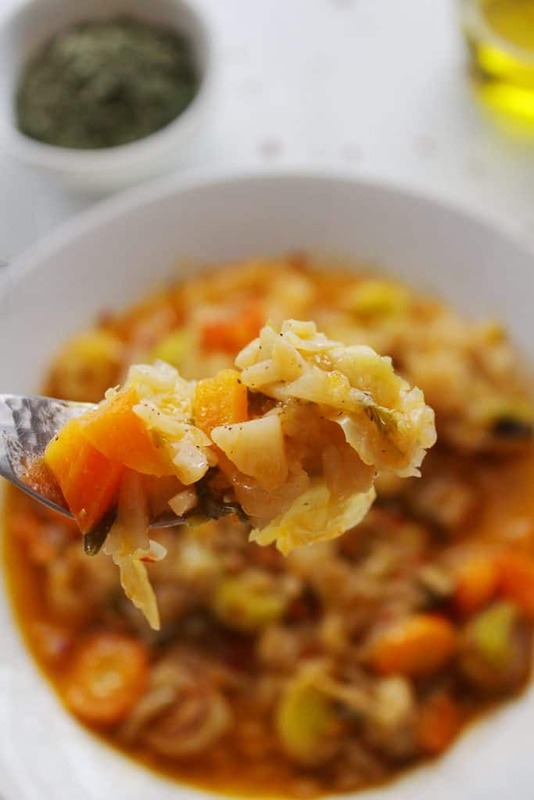 Greek Cabbage and rice stew (lahanorizo) is a traditional thick stew with sweet, tender cabbage, tons of seasonal veggies and herbs thickened to perfection along with rice. It is the sort of food you crave during long and cold winter days, the food that is hearty, filling, nourishing and unquestionably delicious. Perfect recipe for home cook beginners and for those who want to incorporate more veggies into their nutrition. In more or less 30 minutes you will enjoy a delicious meal while reaching your daily vegetable intake. How awesome is that? This dish is an excellent representative of the Mediterranean cuisine, a peasant-type meal made out of the most humble of ingredients. So, let’s cook like a Greek in a village back to the 1960s. Go to your garden (to your grocery store for most of us), grab the freshest veggies and herbs around and throw them in a big pot. Stew them with olive oil and finish them up with some rice. Done! Meanwhile, somewhere on the planet … “Cabbage? Ewwww! No way”. I hear you. I know what you are thinking. “A vegetable smelling so horrible cannot be tasteful”. Allow me to disagree and prove you wrong. Get out of your cooking comfort zone and you are going to kill it with that recipe. Bonus tip: it is even tastier the following two days, so you may enjoy it for lunch. 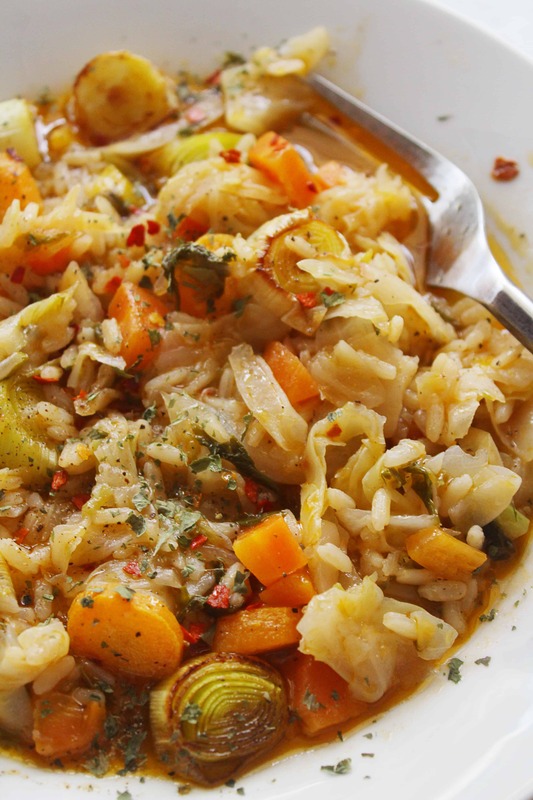 Let’s jump in the details and make this delicious Greek cabbage and stew rice. 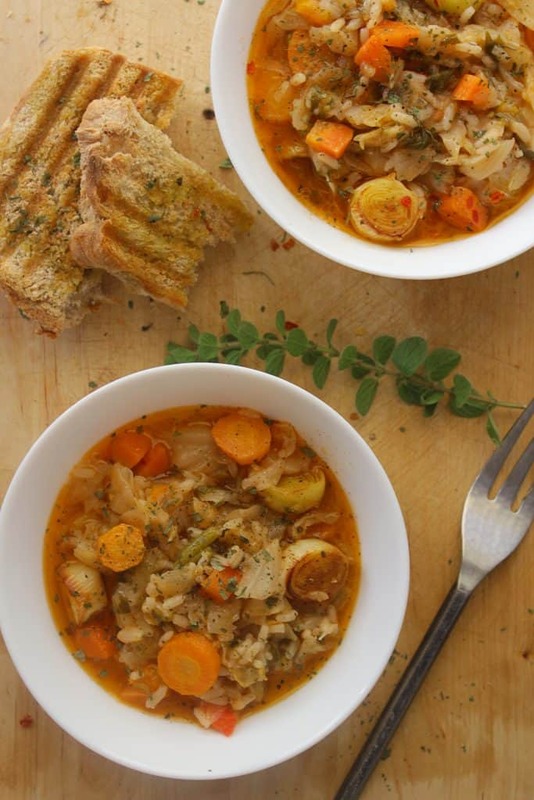 Even though there are many varieties on the market today, this recipe calls for green cabbage and you have to purchase the best around your place (even better if it is organic). Because the quality and freshness of the veggies and herbs are going to make the difference. To begin with, check out the cabbage’s surface. It has to be shiny, with crisp, fresh leaves and without holes, cuts, dark spots or scrapes on it. Pick one. It should be heavy, dense and firm to the touch and the leaves tight against one another. Keep your perfect cabbage whole until you use it. Wrap it in plastic wrap or place it in a plastic bag and store it in the fridge for about two weeks. The time has come. Discard as many outer leaves as necessary in order to reach the shiny, fresh layer. Cut the cabbage into quarters, cut the stem off of each quarter, and then cut the cabbage into big square chunks. 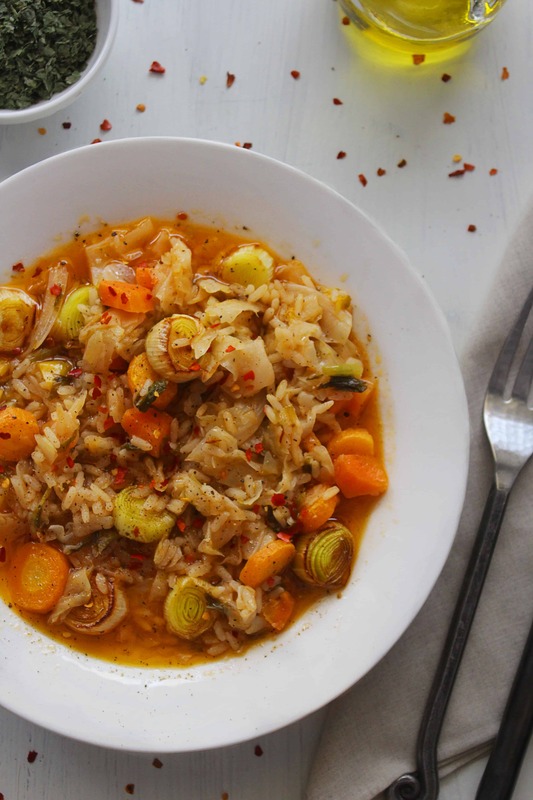 This is the secret behind a perfect cabbage stew and rice. 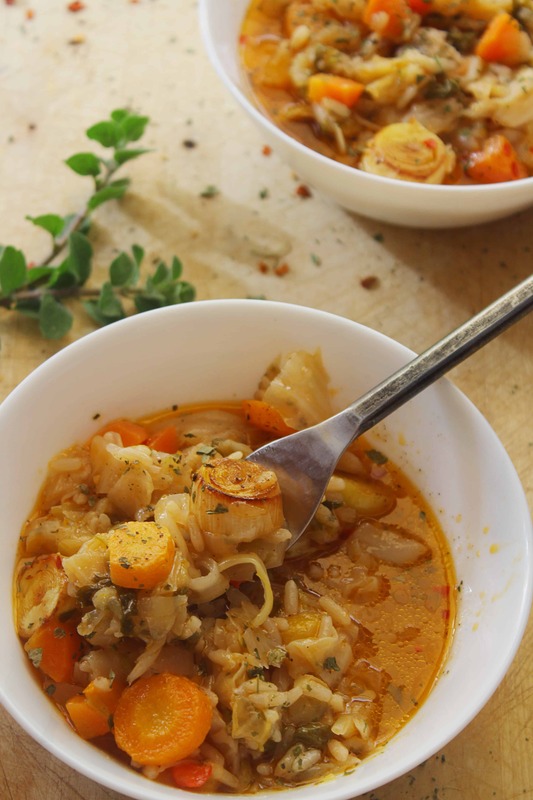 Smaller chunks are going to melt during simmering and not only the main ingredient is gone but overcooking cabbage produces weird flavors and repulsive aromas. You know, this cabbage-like smell and taste. Not good. If you want more crispiness and less cabbagy (is that a word?) flavor, soak the chunks for a few minutes while you prepare the other veggies and herbs. But this is totally optional and maybe more necessary in raw cabbage recipes than in stewed cabbage. This is the fun part. It’s time to play with flavors, textures, colors. I particularly enjoy the time when I have prepared all my fresh greens, herbs. My kitchen smells like a vegetable garden and it reminds me of my grandmother’s kitchen every single time. So, when the children are home, I call them in and prompt them to smell, touch and taste the veggies and herbs. And when there is extra time, they are my sous chefs. I wish they have the same pleasant memories like me and maybe, just maybe, cooking and eating whole food with their kids is going to be their fun game. As always, there are countless variations of this traditional dish. The most “basic”, “traditional” version calls for onion, carrots, dill, and lemon that is the king of the plate. I should mention the addition of tomato and/or tomato paste which is quite tasting as well. My version is very close to both and I suggest you start with this one especially if you are totally new to this kind of tastes. Then, feel free to use your imagination and other favorite vegetables or herbs and make your own favorite cabbage and rice stew version. Add leeks, peppers, garlic, spring onions (scallions), mushrooms, zucchini, parsley, mint, thyme. Variations with sausages and meat are very popular but let’s stick to the vegan-vegetarian version for now. My favorite Greek cabbage and rice stew combo goes with celery, leeks and tomato paste. In case you aren’t friends with celery, you may replace it with dill. Additionally, add more tomato paste or tomato sauce, if you like. It is going to be delicious either way. I highly recommend leeks for extra sweetness. You may skip it or use less BUT keep in mind that the rice is important if you want this meal to keep you full and give you the energy you need. Half cup of rice among tons of veggies and herbs doesn’t make this dish an unhealthy choice. It is well-known that brown rice is generally considered much healthier than white. However, I don’t recommend brown rice for this recipe. The texture will be a sticky, gummy mass and this is a serious no-go for my taste buds. I like to taste and feel the texture of every single ingredient. But this is me. You may think otherwise and make a different choice. I use white parboiled rice in my stew because it gives the perfect almost creamy texture and it’s far less likely to clump together. For extra fluffy rice, I suggest rinsing it before cooking. Well done! I am so proud of you. You see how easy it was? Taste it. Isn’t it just heavenly delicious? My vegan friends should be served immediately and go sit at the dinner table. The rest of you, take a piece of feta cheese (or crumbles) or a spoonful of yogurt and surrender yourself to all that sweetness and sourness flavorful contrast. It is also superlative when paired with a piece of toasted bread like my homemade country bread. Don’t forget to serve it with a flavorful Greek white wine like Moschofilero or Assyrtiko. 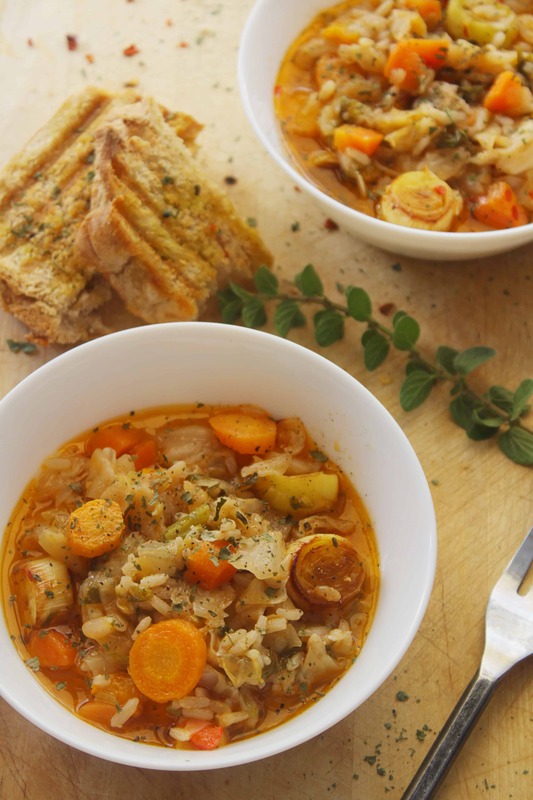 Your Greek cabbage and rice stew is a perfect side dish for grilled meat, chicken, and I would definitely recommend it as an appetizer. It is even better the following day and that’s why it is an ideal lunch. Just add some water to reheat it and enjoy your delicious meal. Discard cabbage outer leaves and cut into quarters. Cut the stem off of each quarter, and finally cut the cabbage into big square chunks. In a large pot over medium-high heat, add the olive oil until it shimmers. Add the onions and leeks. Stir well for 2-3 minutes until softened and translucent. Add carrots, celery leaves, and tomato paste* for another 2-3 minutes. Finally the cabbage for another 5 minutes. Stir well and season to taste. Pour carefully hot water to cover all the ingredients and reduce the heat to a simmer. Cover with a lid. Stir occasionally, until the cabbage is soft for about 10 minutes. Don’t overcook it. Cooking time depends mostly on the size of cabbage chunks. Meanwhile, prepare the rice and thoroughly rinse it under cool water. Drain. When cabbage is soft, add the rice in the pot. * Taste and season if needed, and simmer for about 10-15 minutes until rice is ready. If you want more liquid in your stew, uncover the pot while simmering the rice, add some hot water, about ¼ cup (60ml). Repeat if needed but don’t add too much. When the rice is ready, remove from heat. If you like thicker stews, remove from heat and keep the pot covered until the liquid is absorbed. Serve with fresh lemon juice, freshly ground pepper, parsley and feta cheese (for vegetarians). 1. If you add tomato sauce instead, skip this step. 2. Now it’s time to add the tomato sauce.